There is tremendous poverty in the reservation communities where National Relief Charities works. This poverty brings with it many social concerns, including low academic attainment. The high school graduation rate for all students in Bureau of Indian Education schools is 46% compared to a national average of 89%. 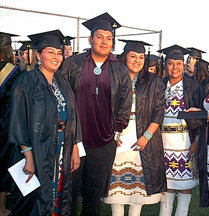 Only 17% of Native high school graduates begin college compared to a national average of 62%. Of the 17% that begin college, only 4% make it through the academic, emotional and financial stress of the first year. Throughout the US, 11% of Native people attain a college degree, less than half the norm of the rest of the country. Kelly mentioned that National Relief Charities considers education the key to long term, sustainable change for the poverty and difficult issues that challenge Indian country. The low incidence of postsecondary education contributes to the sustained poverty on the reservations. The alternative, ensuring access to college and motivating American Indian students to view college as an option, would help create sustainable solutions. One major barrier is that many Native students simply do not see postsecondary education as an option. When one American Indian has success, a whole tribe feels the impact. When one student stays in school, it inspires others who are thinking about college. It also inspires their families. When students graduate college, they have higher earning potential and are more likely to be employed. While in college, these students directly and indirectly help to dispel many myths and prejudices about American Indians, by sharing their rich history of tradition and cultural experiences. While in college, students gain greater self-esteem with each class conquered. This builds confidence for helping other Native students adjust to college life and succeed. This also trickles down to future generations. While in college, students gain a wider worldview that they can later share with their tribal community if they wish to return, and they often do. Students need more of these role models from their own communities who demonstrate that finishing college is achievable and who can have an impact on long-term, positive change, both socially and economically. In Kelly’s March 7 post on self-determination, she writes that many tribes had the opportunity to revamp their educational systems and businesses from the previously federally-imposed systems. Their new systems are culturally relevant and better meet their peoples’ needs. The changes that have steadily come about for many tribes as a result of self- determination include dramatically increasing the number of trained and educated professionals such as teachers, nurses, attorneys, and social workers — the people who can help make positive change for a tribal community. All of this makes clear that education is crucial to sustainable social solutions. This entry was posted in Humanitarian and tagged American Indian, education, Sustainability, sustainable. Bookmark the permalink. Post a comment or leave a trackback: Trackback URL.